Journal: I had a nice big breakfast and left at 7:30am. The motel owner was concerned about my plans to get to Licola and wanted a number there to call to check I was OK. I explained that I had a tent and food and would be fine. 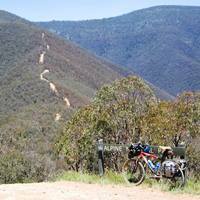 For the first couple of hours I followed a reasonable quality road upstream through the beautiful Wonnangatta Valley. It was a lovely day and very peaceful. Around 10:00am I reached the Billy Goat Bluff Track turn-off and began to ascend the locally-famous track. It ascended 1,200m in 7km and was extraordinarily tough. In some places I could barely make forward progress and the bike occasionally threatened to tip over backwards, the track was so steep. It was also very warm and sunny and the flies were bothersome. It was demoralising rounding each corner and seeing the track winding steeply ever upwards. I had lunch on the first false summit, feeling very tired. I gradually got more exhausted and found the loose rocky surface almost impossible to get traction on. I wanted it to be over but had no alternative but to keep going. To top it off, my water began to run out and I was getting dehydrated. I also got a puncture. I was passed by a small 4WD tag-along tour group nearer the top and they were mightily impressed by my effort. Finally, around 3:00pm, I reached the top and had a slow gradual rough descent a short way to the Moroka Valley. I found a small stream along the way and replenished my water and drank my fill. Then the road followed the Moroka River gradually upstream. Again it was peaceful and beautiful. I managed to maintain a reasonable pace but had given up on trying to get to Licola. The track followed a ridge further up with great views to the north across the mountains, some of which still had snow on them. Near the top I found a possible campsite but then moved on when I decided I could do better. I passed Arbuckle Junction and a few kilometres later found a great spot to camp at Lost Plain, a high alpine meadow, at about 7:30pm. I set up camp and ate as the sun set and was in bed soon after 9:00pm. Still having nightmares about the Billy Goat Bluff Track.